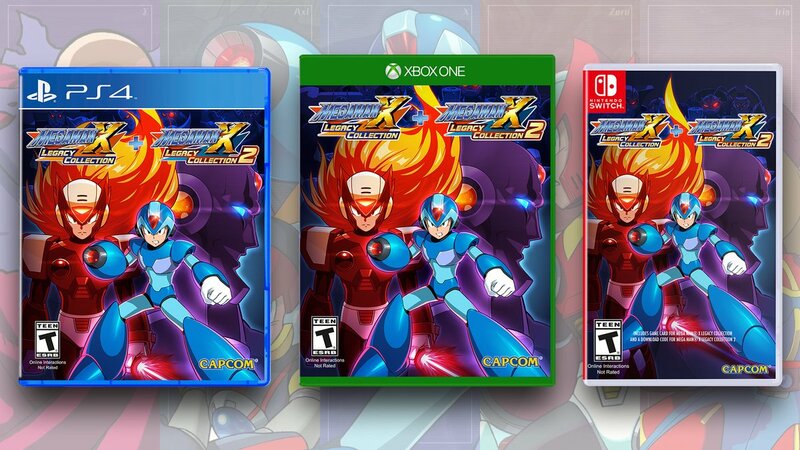 All three physical versions of Mega Man X Legacy Collection 1+2 are now available to pre-order from GameStop: Nintendo Switch, PlayStation 4 and Xbox One. The PlayStation 4 and Xbox One versions are 2-disc sets; Legacy Collection 1 on one disc, Legacy Collection 2 on the other. For Nintendo Switch, the bundle will include a cartridge with Legacy Collection 1 and a digital download voucher for Legacy Collection 2. If you're looking to import the Japanese versions, your best bet at the time of this writing is Play Asia, Amiami or Nin-Nin Game. Amazon Japan are not shipping the games outside of Japan at this time. That may change closer to release but there's no guarantee. UPDATE: International shipping now available from Amazon! Lastly, I'd like to point out that the standalone physical release of Rockman X Anniversary Collection 2 is indeed shipping on its very own Nintendo Switch cartridge. It's the only way to own the second collection on a physical Switch cartridge because on the 1+2 bundle – both in Japan and the US – it's in the form of a digital download voucher. You might want to look into importing it! Are you seriously, that, Rockman X Anniversary Collect 2 for Switch will have both physical versions in Japan, Protodude ? What about Rockman Legacy Collection 1+2 ? IT will have both physical versions for Nintendo Switch in Japan as well ? Please confirm for both so I can understand. The Japanese bundle has 2 on a download code despite the individual on cartridge. Which one ? I am confused. The two pack has LC1 as a cart and LC2 as a code. The individual games both come on cart though. If you want both individualy, it's about 90 for both. I'm just sticking with the US Xbox one and Switch two packs. I know it doesn't come with the cool posters, but I already have posters I don't display as it is. I prefer to have two games that have physical each. I dont want downloading code at all. Does that mean I have to get PS4 version instead ? I am talking about Japan. So, Zero looks evil on the box? Okay then. He was at one point. Not sure what are you complaining about. Definitely going to get this on Ps4 but the Japanese version cover is leagues better than ours, why change it for the english release? Do you think they will do that? I can say with 99.9 percent certainty that's not gonna happen. In your dream. No, they will not. The Switch is region free but what isn't known yet is if the games will play in English on a US Switch. I grabbed both from Amazon for about $85.13 if anyone wants to know about that. Amazon also says it will arrive in 3-6 days. We don't know yet. IIRC there are a couple Japanese Switch games that, when played on your English profile, automatically switch to English text. Considering everyone is getting the Collections around the same time, its likely both languages will be available. At the very least, hopefully there's an option to switch between the US/JP versions of the games like in MMLC1&2. Not gonna import just for better box art, but why Capcom insists on doing pathetic box art in the west just blows my mind. They might as well add that silly "swoosh" art they used in the 2000's to the art too. Sheesh, as usual, people are whining about something as minor as the box art. The Switch box is the better of the 3 to me since it doesn’t really cut off the enemies at the top. So it's not quite the screw job that MM Legacy Collection 1+2 was, but at least it's yet, yet, YET another opportunity to poke American Switch owners in the eye. That box art is so bad, oh my god. You mean in comparison? If you are just saying that cover art is just bad ... like period I demonstrably disagree, I freaken love this new artist he captures everything perfectly and is fluid. I'm sure you draw like a vey angry kindergartner. I don't know why, but I can just hope that there will be a special DLC to play as Axl and Vile in all Megaman X games in a WHAT-IF storyline. I wanna see Axle The Red's reaction when he see Axl in battle. Why isnt this available on american or canadian amazon? Can anyone please reply if any info is available? Thankyou so much buddy! Regards from canada!